Check out this very amazing BRICA Fold N’ Go Travel Bassinet by Brica. It is super easy to pack and carry. Very simple to set up for nap-time anytime, anywhere. It is light weight, very durable, and extremely safe for babies. 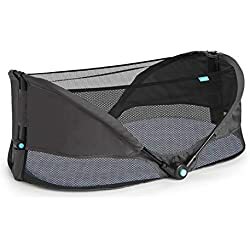 The Brica Fold ‘n Go Travel Bassinet features sturdy side walls with Safe-T-Lock system, mesh panels, and breathable fabric to provide both comfort and peace of mind. Includes a removable mattress pad and sheet for easy cleaning. The Brica Fold’n Go Travel bassinet is a fold bassinet that gives to your baby a safe and comfortable place to sleep anywhere. This travel bassinet is very easy to pack and carry and includes a convenient carrying handle. It can be fold very flat, and it fits into suitcases very easily, you may not even notice it. It may even fit into the rolling carry-on which makes it the perfect option for travelers with babies. Besides, it is extremely lightweight so it is very easy to take it anywhere. Because it takes so little space, it is very useful during baby’s first months when visiting grandparents or friends, especially during nap time. the mesh side panels provide good airflow in hot weather. With its easy10-second set-up, it very convenient during a long car trip to give your baby a place to stretch and when you make your a short stops. It is also a good option for using with a mosquito net when camping or picnicking. All it takes is 10 seconds to fold down the bassinet or to set it up. What Is included with the Bassinet? Fitted sheet: Machine wash warm. Tumble dry low and no bleach. Mattress pad and lining: wash the surface with warm water and mild soap and air dry. What makes it more user friendly and what makes moms love it even more is the fact that you can throw it in the washing machine when you get back from your outing. The Brica bassist made baby nap-time as enjoyable as can be. I was very impressed with the quality and the ease of use. I highly recommend it. Brica Inc. If you’re looking for an infant travel bassinet that won’t cost a fortune or take up your entire trunk or have to be carried as an extra suitcase when traveling then, the Brica Fold n Go bassinet is the best option. Disclaimer: LifesMainEssentials.com is a participant in the Amazon Services LLC Associates Program, an affiliate advertising program designed to provide a means for sites to earn advertising fees by advertising and linking to amazon.com, amazon.co.uk, amazon.ca and other affiliates programs. Amazon and the Amazon logo are trademarks of Amazon.com, Inc. or its affiliates, We may receive a small commission if you click on one of our links and make a purchase. Thank you for supporting LifesMainEssentials.com and helping me make it the best site possible! Previous PostBabies Main Essentials – What Do Babies Need Most?